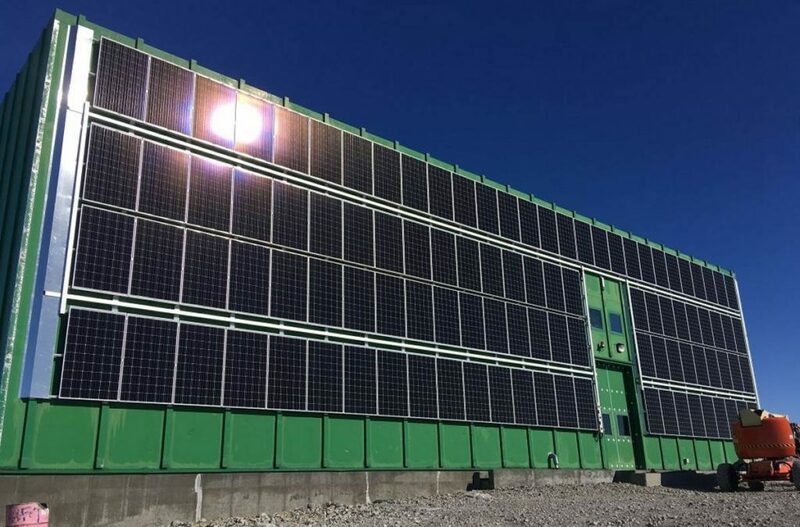 A 30kW wall-mounted solar power system comprised of 105 solar panels was switched on at Australia’s Casey Research Station in Antarctica yesterday. According to Australian Antarctic Division Director Kim Ellis, this is the first “solar farm” at an Australia research station and among the largest on the continent. The system is expected to generate equivalent to 10% of the station’s annual electricity requirements, reducing its dependence on diesel generators and the emissions that accompany diesel-based energy generation. Diesel would also be a pretty pricey item to ship all the way to Antarctica, not to mention the threat posed by spills to the (relatively) pristine environment. The biting cold and wind proved a challenge during the installation, particularly when working with small items such as brackets and bolts, and fixing the panels to the wall. So why aren’t the panels on the rooftop? The project has been a collaborative effort between Australian Antarctic Division and Masdar. “It will test the durability and suitability of the solar panels to the strong wind and snow load in Antarctica and help us to determine if it is an efficient way of powering a station,” said Masdar CEO Mohamed Jameel Al Ramahi. 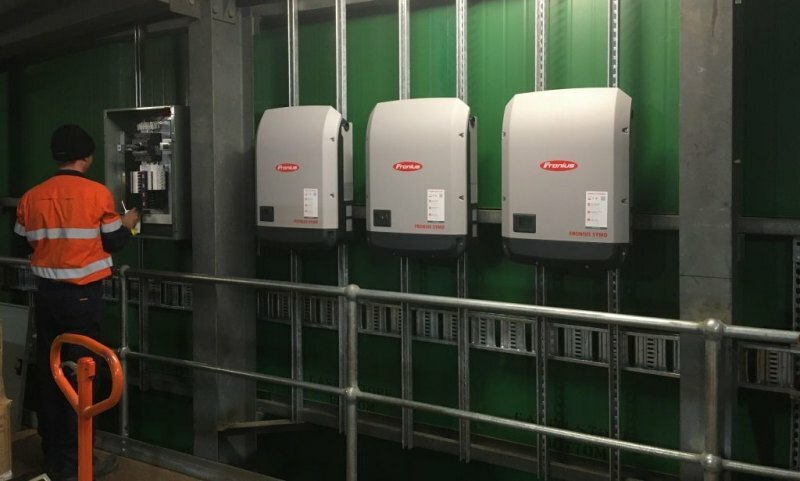 Aleo Solar panels and Fronius inverters have been used for the system. While this may be the first installation of its type for Australia in the Antarctic, solar power has been in use by the Australian Antarctic Division for nearly two decades, albeit in much smaller systems. Up to this point, solar had mainly been used for powering VHF radio repeaters, remote radio installations, automatic weather stations and in remote area power supplies (RAPS). In the case of the latter, the first RAPS were installed during the 2000-01 summer at Bauer Bay and Green Gorge, followed by systems at Brothers Point, Hurd Point and Waterfall Bay field huts in 2001-02. 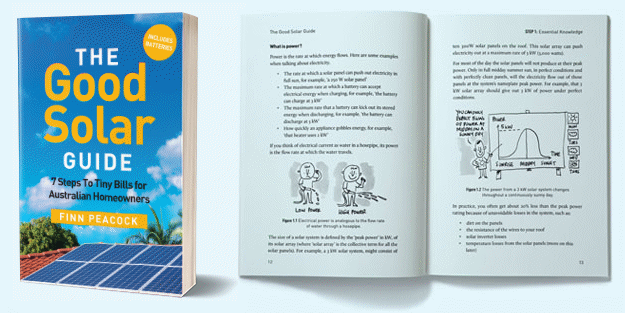 The batteries in these systems can be charged using petrol, solar and wind power. Trivia: Casey, Davis and Mawson Stations all have a postcode – it’s 7151; one it shares with Heard, Macquarie and McDonald Islands. Previous Article: What The Hell Are ZNShine Solar Panels? Don’t mono-crystalline panels work better than poly-crystalline panels in low-light conditions. If they’re going to the (expensive) effort of installing solar, I’d have thought it would make more sense to get a premium system, that works better in antarctic low-light conditions (autumn). I wonder if the installer is CEC accredited and estimated the winter shading … ie; the whole planet shades the panels. There doesn’t appear to be any consistent difference between polysilicon and monosilicon panels in low light conditions. The panels they are using are pretty premium and come from a German company that specializes in solar panels for harsh environments. I’ve long wondered what the transmission loss is of solar panels in Central Australia. We have lots of unproductive land that would suit solar farms but is it unviable due to the losses to transmit the electricity to capital cities?